Platform319 is the result of over ten years of research & development, millions of dollars, and the collective effort of many individuals dedicated to creating the world's premier web & portal management platform. The Platform contains a set of proven technologies and hundreds of business functions & applications. To appreciate the revolutionary difference between the Platform319 Suite and all other website design, content management, CRM, or document management applications it is essential to understand its base architecture. Platform319 was designed to be an integrated business solution where the centric connection is a web server. 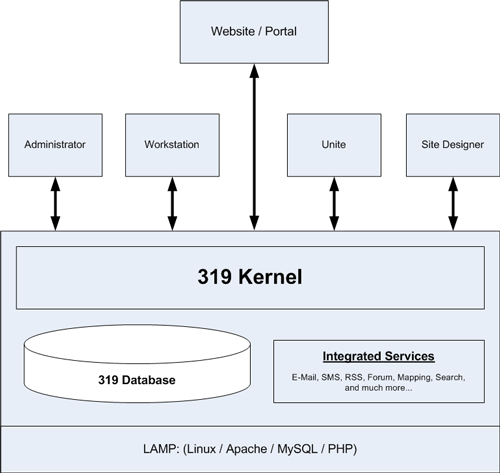 Internally it is based on “LAMP” architecture (Linux, Apache, MySQL, and PHP). The platform at the core is the Kernel. All applications running within the Kernel (Administrator, Workstation, Unite, Site Designer, and others) share a common database. Because of this, all applications are fully integrated with one another. That is not to say each application requires the other. Each is a stand-alone solution within the Kernel, sharing a common database. Platform319 is a business platform because of the nature of its common database. All applications can share and use the common data. This structure is not available in other products. An simple example would be a lead entering a website through dynamic form created by Platform319 Administrator can be immediately acted upon in Platform319 Workstation where the integrated Kernel services of mass emailing, response mail, SMS (cell notification), etc., can be automatically scheduled to run. Platform319 is secure, scalable, powerful, expandable, proven, 100% dynamic, and the premier platform for all websites and portals. It was designed to liberate businesses by supplying an integrated solution. Business professionals demand self-service and independence. Platform319 delivers well beyond expectations.